The design of our vertical CNC lathes is manifold. One of our vertical lathes of the F-, P- or V-Series will meet and satisfy your demands. Here you´ll find more! FLEXIBLE TURNING CELL (F-SERIES) – UNIQUE SYSTEM PLATFORM! 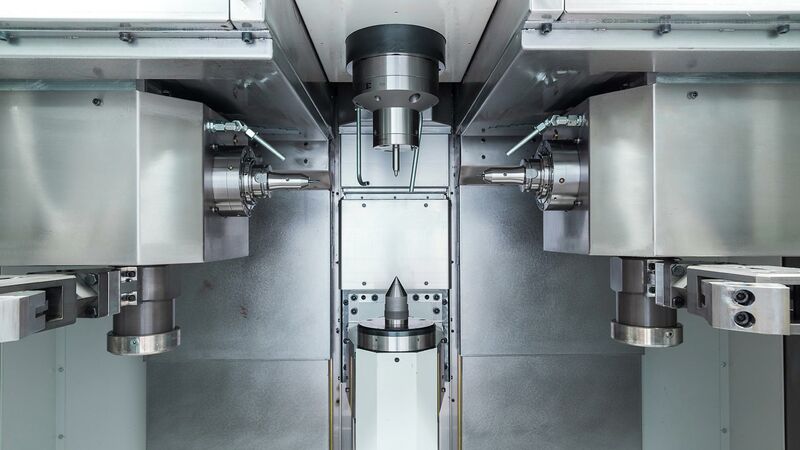 Schuster F40 is our ideal mechanical engineering solution for efficient four-axis vertical shaft and flange machining and end facing with lengths of up to 800mm, in large production numbers. The foundation of the system is the oscillation-damping mineral cast machine column. 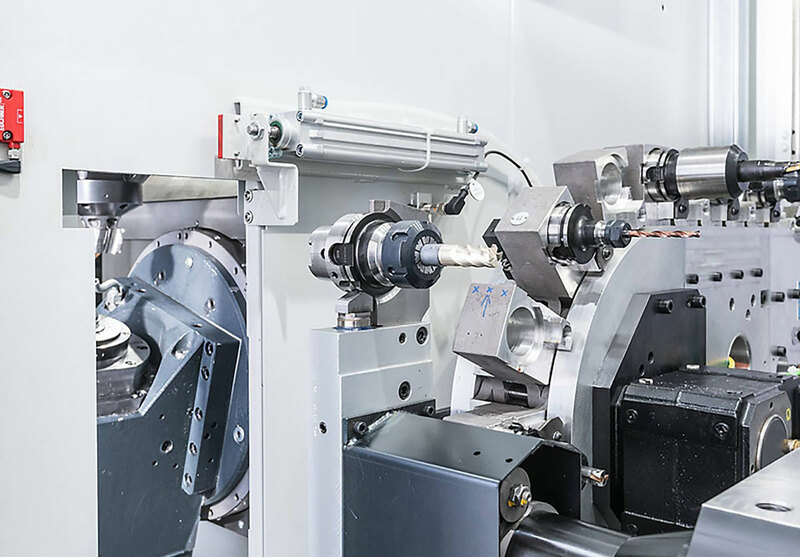 Turning, milling, grinding or hobbing – with freely selectable applications such as a B-axis milling unit, centre-turning unit, counter-spindle, two-axis lathing with steady rest and NC quill, and robot or handling systems for loading and unloading – we are always perfectly equipped and can even make a turning cell into a flexible combined cell that is specifically coordinated to your applications. Thanks to the rigid motor spindle (26KW at 150Nm, optionally 35KW & 300Nm) and the excellent thermal stability of the mineral cast machine column, thermal growth can be kept to a minimum – a solution that is predestined for grinding and HRC. Efficient four-axis machining reduces primary processing time. Moreover, synchronous loading and unloading results in short secondary processing times. A fully automated pick up solution with low space requirements and simple operation. 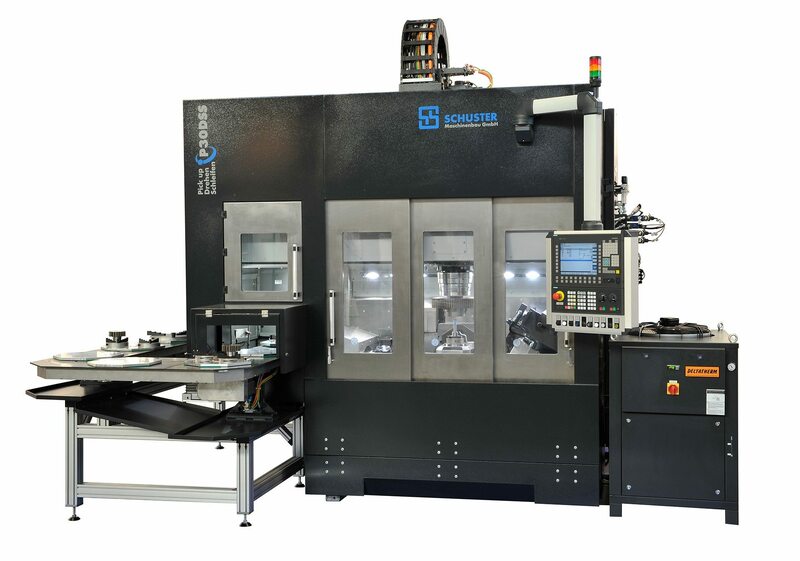 Whether for automotive, powertrain, mechanical engineering, soft machining or hard machining applications, the Schuster P-Series is a pick up solution that is tailored to your requirements. The classic double-spindle PD30 machine is also available for two-sided machining applications. Our speed and precision not only stems from our short chip-to-chip times, but we also have the power – 18kW and 63Nm. This enables us to increase cutting data while shortening cycle times. Direct drive offers improved removal volumes when using power tools for machining. Used together with the appropriate indexed conveyor, Schuster's patented chip and spray-protected loading and unloading unit allows us to transport your raw component/finished component quickly and precisely. VERTICAL TURNING CELL (V-SERIES) – SIMPLY SMART! Our V-Series is characterised by its smart construction. 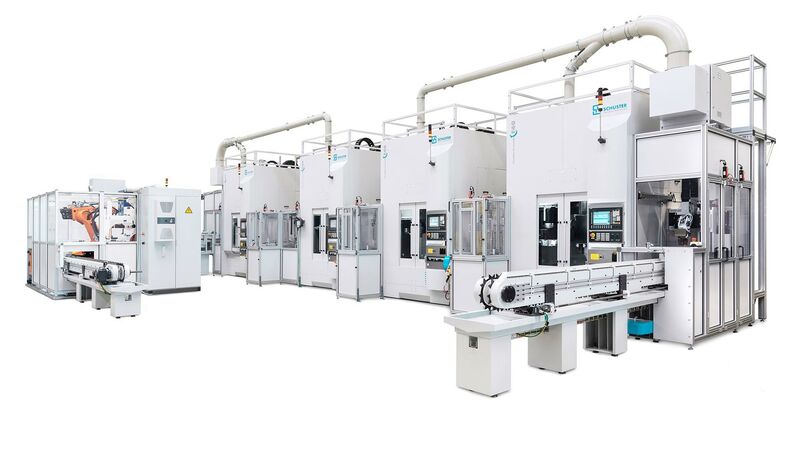 This is not only because it features a uniquely compact machine design, at only 850mm per module, but also because it is capable of dividing a single machining procedure over several modules with homogeneous cycle times – which is simply smart! V20 – with freely selectable options! Metal-cutting production is currently undergoing a rethink, in particular in the context of workpiece materials that are difficult to machine. The tooling industry offers solutions with increased coolant pressure to enable more efficient cutting of materials such as titanium, Inconell or duplex steels. We offer you this possibility using specially sealed turret and cooler units with band filters. The Schuster V20 has the amazing ability that places it far ahead of conventional pick-up solutions. With loading and unloading units, component conveyors or swivel functions, it is able to reduce workpiece changing times to a minimum, thanks to the rapid handling grippers, making it far superior to conventional pick-up machines. Do you have any questions regarding the manufacturing with our flexible, pick up and vertical CNC lathes? Simply fill in the form. One of our specialists will get in contact with you and will give you competent advice.